“Electrical and medical engineering researchers create device that makes it easier to measure pressure inside the eyes of people at risk for glaucoma. Researchers at Caltech have developed an implantable pressure sensor that can reside in the human eye for years at a time while wirelessly sending data about the eye’s health to the patient or medical professionals. The implant could make it easier to prevent one of the leading causes of blindness. “By bringing together novel packaging and microelectronic technologies, and in close collaborations with ophthalmologists, we were able to design a miniaturized, fully wireless, and highly-sensitive sensor,” says Azita Emami, Caltech’s Andrew and Peggy Cherng Professor of Electrical Engineering and Medical Engineering and a Heritage Medical Research Institute Investigator, and paper co-author. The sensor is designed for monitoring the eyes of patients with glaucoma, a disease that causes gradual loss of vision, usually as a result of excessively high pressure inside the eye. Glaucoma is the second-most-common cause of blindness after cataracts, affecting 65 million people worldwide. Patients at risk for glaucoma are required to make regular visits to an ophthalmologist to have their intraocular pressure (eye pressure) checked, usually with a device called a tonometer. A tonometer presses a small prism against the surface of the eye and determines the pressure inside by measuring how much the surface deflects, kind of like a person squeezing a basketball with their fingers to see if it’s sufficiently inflated. Tonometers are considered the gold standard for measuring eye pressure, but they have the disadvantage of only being able to measure pressure while the patient is visiting their doctor. That presents a problem because eye pressure fluctuates throughout the day, and if pressure spikes occur at times outside of when a patient is having a checkup, their doctor will not know they are occurring. The procedure also requires the use of local anesthesia. Aubrey Shapero and Abhinav Agarwal (MS ‘14)—Caltech Engineering and Applied Science graduate students working in the labs of Yu-Chong Tai, the Anna L. Rosen Professor of Electrical Engineering and Medical Engineering, and Emami—have created a device that can monitor eye pressure continuously. The device is a little smaller than a dime and is implanted in a spot on the white of the eye where it will not interfere with vision. It consists of a pressure sensor, control circuitry, and an antenna. The implant has no battery, making it small and long lasting. During a reading, radio waves from a handheld scanner are received by the antenna and generate a small voltage that temporarily powers up the device, which then takes a pressure reading and sends the signal back to the reader using the same antenna. A big advancement with the device is its functional longevity—as long as four years according to projections based on accelerated laboratory testing. Other attempts to build similar devices have been stymied by the harsh environment inside the human body. Between fluids corroding electronics and sensors being fouled by tissue growth, other devices previously developed both at Caltech and elsewhere functioned for a month at most before needing to be removed. The Caltech team overcame that issue by encapsulating their device in a specialized coating that consists of a silicone-oil bubble surrounded by a biocompatible polymer called parylene. “The encapsulation technique, which we call ‘parylene-on-oil,’ is our key breakthrough,” Shapero says. “The combination of liquid silicone oil and parylene shows far greater pressure reading stability and corrosion protection than just silicone gel or parylene alone. The device could also be modified to provide treatment by adding a valve that would release small amounts of fluid as tears, when pressure rises too high, says Shapero. The researchers say they hope to continue developing the device and could begin testing it in patients in the next several years. “We are preparing for further testing with our collaborators at Keck School of Medicine of USC, and we’re aiming eventually to get to human clinical trials and FDA approval for use in patients,” Agarwal says. 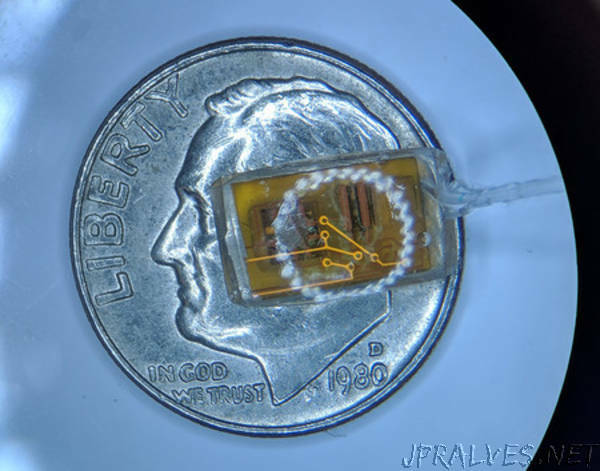 The paper, titled, “A Wireless, Low-Drift, Implantable Intraocular Pressure Sensor with Parylene-on-oil Encapsulation,” was presented at IEEE Custom Integrated Circuits Conference (CICC) in San Diego in April. It has been published in the IEEE Xplore database.